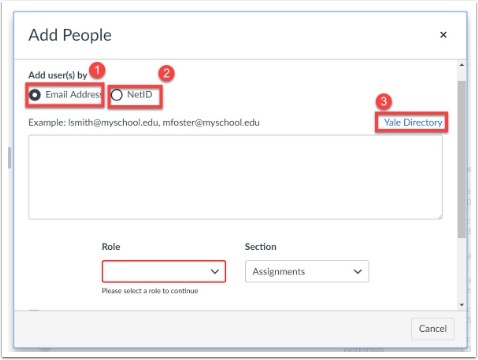 Canvas @ YaleInstructor Guides Setting Up Your Course SiteHow do I add users to my course? For official course sites, your student registered student enrollments will be enrolled in your course site automatically. Students who made revisions to their registration. In the course navigation, click the People link. In the pop-up window, select how you want to add people. You can add them by their email address  or by their NetID . 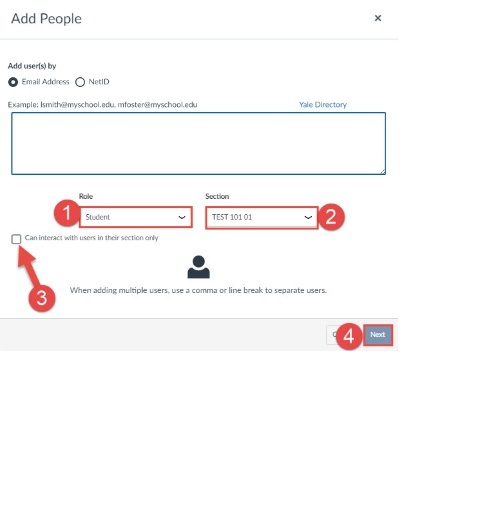 If you need to use the Yale Directory to look up an individual, you can do so by clicking "Yale Directory" . In the text box type or paste the email addresses or Login IDs of users to add to the course. You can add multiple users at one time by putting a comma between each user. Canvas will verify that the account is valid . If you are not ready to add the user, click the Start Over button . Otherwise click the Add Users button . Canvas will automatically send the user an invitation to participate in the course. Until the user accepts the course invitation, the user's status will display as pending. Once the user has accepted the course invitation, you can interact with the user in the course. You can also send messages to the user via Conversations (Inbox). If necessary, you can change a manually added user's role. Just click the gear icon  to the right of the user you need to update and then click the "Edit Role" button. 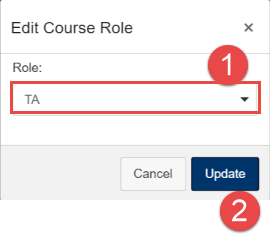 Select the new role (remember not to select a protected role) from the Role drop-down menu  and the click the Update button . You can remove any user that you have manually added. Note: If the user is being enrolled into the course by registrar data, you will not be able to remove them. 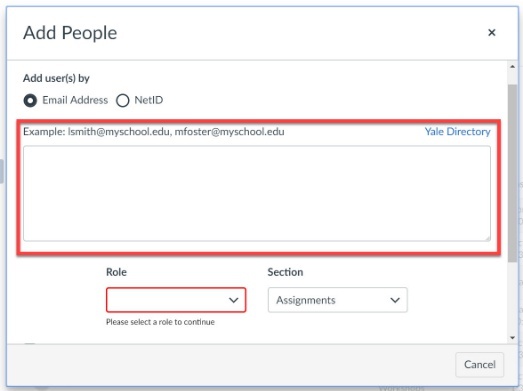 From the People Tool, click the three dots associated with the user you would like to remove  and click Remove from Course . Prev: How do I create folders in my course "Files" area? Next: How do I publish or unpublish my Canvas course?